As I was sitting at my desk, eating a salmon Caesar salad, checking e-mail, looking at products, and talking on the phone – I couldn’t take my eyes off the new Tocca Baci Lip Glosses. They are so sweet. And I don’t mean sweet in terms of surfer dude sweet. I mean sweet in terms of the perfect definition of ideal sweetness. 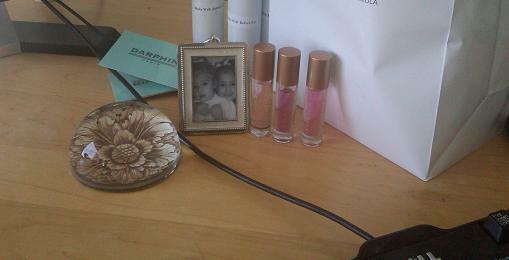 Little tiny rollerball lipglosses, 3 perfect pastel colors, 3 italian escapist names – Amalfi, Catania, Salina. I just keep thinking how when I pull one out of my purse, how everyone will ask me what it is. And for $14, they are even more sweet (now I mean surfer dude sweet). I am in trouble if my daughters find them – I will never see them again!